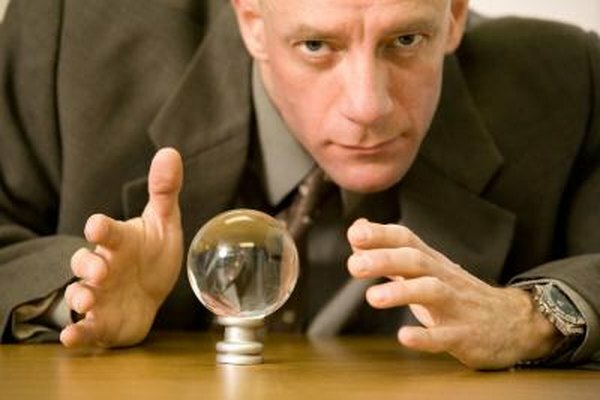 Advocates claim that technical analysis can predict the future. Investors are forever searching for ways to improve their returns and lower their risks. Some investors advocate technical analysis, which claims that previous prices and volumes can predict future price action. One of the weapons in the technical analyst’s arsenal is the volume candlestick. Analysts inspect candlestick charts to divine clues for buying and selling stocks and other securities. A standard candlestick combines a stock’s high, low, open and close prices into a single image composed of a rectangle with two extra lines, or wicks. The rectangle, or body, is sized to show the difference between the open and close prices. The top wick’s length indicates the difference between the high and the open or close. The bottom wick similarly marks the low price. If the stock price falls during the day, the body is blackened to indicate that the top horizontal body line is the opening price and the bottom body line is the closing price. Alternatively, a red or white body -- both colors mean the same thing -- indicates a higher closing price. In this case, the top body line is the closing price and the bottom body line is the opening price. A volume candlestick adds an extra dimension of information: the candle width. The higher the trading volume, the wider the candlestick body. Low-volume days result in skinny candlesticks. Volume is also plotted at the bottom of the chart as a series of rectangles. A red volume bar is a lower-price day and a green bar is a higher-price day. Chartists plot candlesticks on a daily basis and look for various shapes and patterns to indicate the expected direction of stock prices. The width of the volume candlestick represents volume that has been normalized to show its percentage of a “look back” period. For example, if you used a four-month lookback, then the width of each daily candlestick represents the day’s volume as a percentage of the four-month volume. Some days yield fat candles that take up more space. The result is that the x-axis of the volume candlestick chart, representing time, is not regularly spaced, even though the y-axis, price, is. Technical analysts attach significance to dozens of different patterns formed by a sequence of volume candlesticks. Technicians believe that a price trend or reversal carries more predictive power if trading occurs on high volume. For example, a “marubozu” pattern is a tall candlestick, indicating a large distance between opening and closing price. If a fat, red marubozu candlestick appears after several days of price declines, technicians might predict a price reversal following panic selling. Learning to interpret volume candlesticks requires a significant time commitment. Bloomberg Businessweek: Technical Analysis: Useless? How Do I Chart the Stock Market With the Wyckoff Method?